It’s portable and easy to use – a game changer for activity provision. You can now view your personalised Daily Sparkles on a tablet or smart phone. 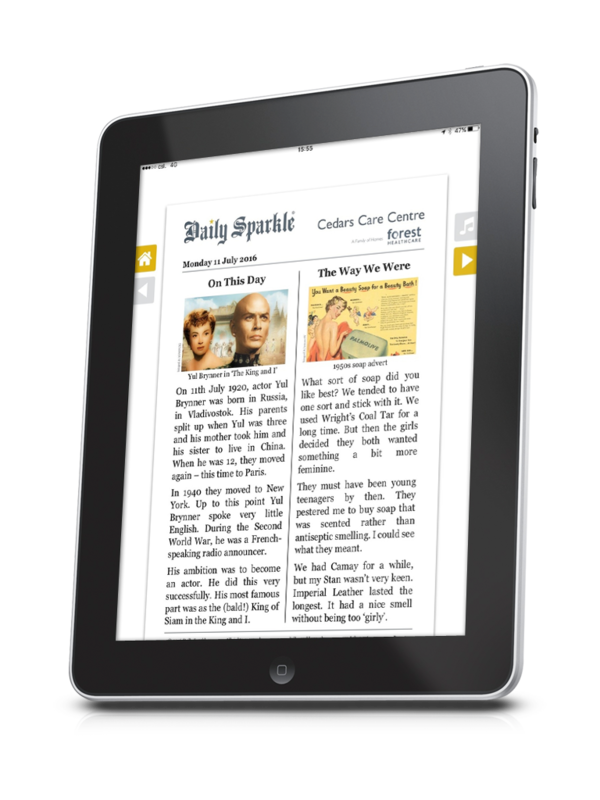 Visit the App store on your iPad or the Google Play Store on your Android tablet – and search for the “Daily Sparkle” . Alternatively, simply click on the icons on the bottom of this page. 1) The email address at which you receive your Daily Sparkles. a) If you are a subscriber you can find your account ID in the subject line of the email with your Daily or Weekly Sparkle attached (see illustration below). b) If you are on a free trial with us you will be sent your account ID by email just after you sign up. Can I get the Weekly Sparkle? Can I access my Sparkles off line? How do I play the singalong track? Look for the music icon when you are on page 3. Can I view on a TV? Yes, via an Apple TV or a Google Chromecast. Please get in touch if you need any help, on 0800 228 9698.